The paper below has something like 200 authors from over 100 institutions worldwide. Many people claimed just a few years ago (or more recently!) that results like this were impossible. Will they admit their mistake? In Scientific Consensus on Cognitive Ability? I described the current consensus among experts as follows. See figures below for a summary of progress over the last six years. Note 4% of total variance = 1/25 and sqrt(1/25) = 1/5, so a predictor built from these variants would correlate ~0.2 with actual cognitive ability. There is still much more variance to be discovered with larger samples, of course. General cognitive function is a prominent human trait associated with many important life outcomes including longevity. 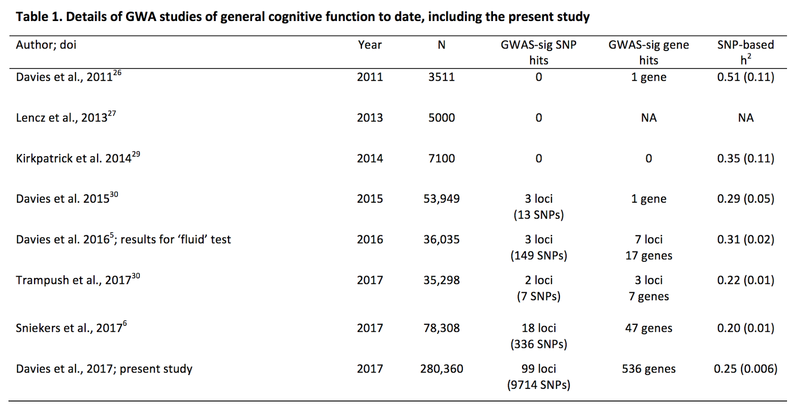 The substantial heritability of general cognitive function is known to be polygenic, but it has had little explication in terms of the contributing genetic variants. Here, we combined cognitive and genetic data from the CHARGE and COGENT consortia, and UK Biobank (total N=280,360). We found 9,714 genome-wide significant SNPs in 99 independent loci. Most showed clear evidence of functional importance. Among many novel genes associated with general cognitive function were SGCZ, ATXN1, MAPT, AUTS2, and P2RY6. Within the novel genetic loci were variants associated with neurodegenerative disorders, neurodevelopmental disorders, physical and psychiatric illnesses, brain structure, and BMI. Gene-based analyses found 536 genes significantly associated with general cognitive function; many were highly expressed in the brain, and associated with neurogenesis and dendrite gene sets. 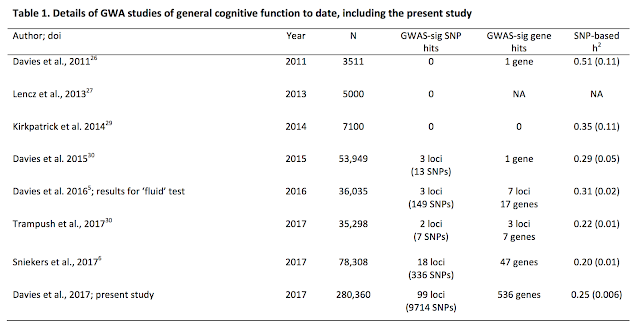 Genetic association results predicted up to 4% of general cognitive function variance in independent samples. There was significant genetic overlap between general cognitive function and information processing speed, as well as many health variables including longevity. Damore vs Google: Trial of the Century?